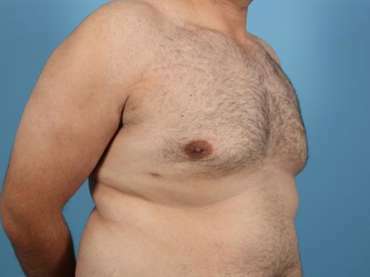 21 year old with gynecomastia who desired correction. Procedure performed through small incisions at the border of his areola. This 27-year-old man from Charlotte, NC had concerns about his chest and was self-conscious about removing his shirt in front of others. Dr. Adam Augenstein performed suction assisted liposuction of the breast and chest in this male breast reduction surgery for gynecomastia without any skin excision or long scars. Only the small incisions that were used for the liposuction portion were used to remove the remaining breast tissue. The patient is shown 1 year after his procedure.